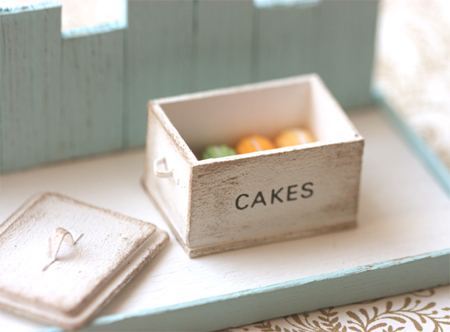 Miniature dollhouse food - shabby chic white cake box made with wood in 1/12 dollhouse miniature scale. IMPT: The set of macaron colours that you'll be getting will be exactly the ones in the last photo. Perfect for your dollhouse kitchen or patisserie cake shop use. A very versatile piece, you can put it on your kitchen table, counter, or on top of your cake shop counter. Painted in a warm white colour, I further “de-stress” it to give it a shabby chic feel. 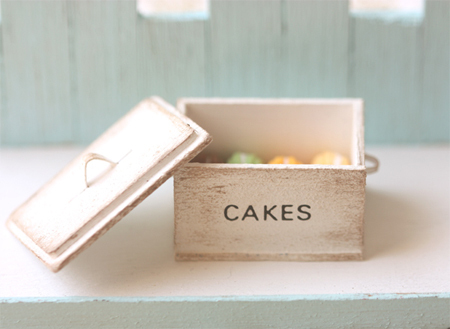 This listing is for the shabby chic white cake box, which is inclusive of the macarons. There are 8 multi-colored macarons. Cake Box measures approximately 2 cm tall (with lid on) x 2.8 cm at its widest (with lid on).